With cold weather months upon us chili is a staple in most homes. There is just one problem, the “run of the mill chili” can get mundane season after season so we have to spice it up a little. In our home, we are constantly trying new spins on our family favorites to keep it interesting in the kitchen. Warm yourself during the winter months with this awesome Sausage Chili recipe that’s loaded with flavor and packs a punch that’s super filling. 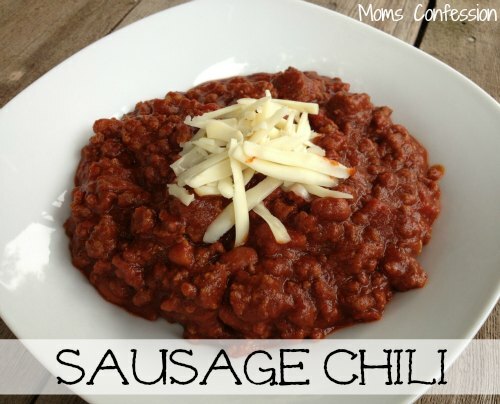 Savor in the flavors of chili for dinner tonight with your family…you won’t regret it! Kristi divulges her favorite household tips and fires up the stove to share fabulous family recipes at Moms Confession. She lives in her flip flops year round with her husband and two preteen boys in Houston, TX. Strike up a conversation on Google+ and share your favorite recipes with her too!